Like most self-proclaimed beer snobs, I prefer a hopped up American Pale Ale or hearty Imperial Stout when given a choice (although I would be remiss if I didn’t give a shout out to our old friend, the Belgian Quadruple). My dad, on the other hand, prefers a nice, cold lager. Don’t get me wrong, I don’t mind imbibing in a glass or two from time to time, but there isn’t much you can do to a lager to wow me. Time and time again, when I am out dining with my parents and it’s time to place our drink order, they will lean over to me with the mighty beer list in hand and ask me to suggest a beer for them. It is easy for my mom (she likes Porters – particularly the Breckenridge Vanilla Porter). My dad on the other hand is a bit tougher. I usually blindly pick some lager off the menu that he probably hasn’t had, hoping it doesn’t show up in one of those clear, green bottles (also known as…the beer skunkifier). Next time, I think I will just go with the Brooklyn Lager for him. It is about as non-offensive of a beer you can find. Or maybe really surprise him, and sprinkle in a Kolsch or two. Anyone else find this to be the case with your parents? Maybe it’s a generational thing. Beer Goes With Everything…including dads. 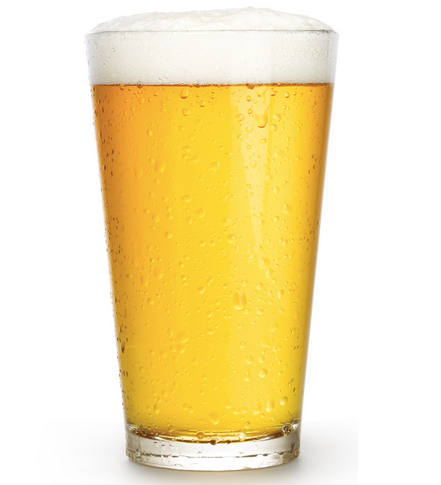 This dad prefers an ice cold German Veltins…about the best Pilsner I have ever had!